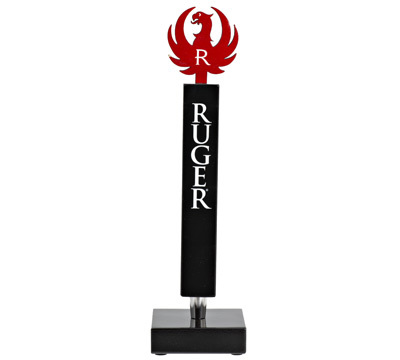 This unique tap handle is manufactured exclusively for Ruger. It is the perfect complement to any 'man cave' or beer dispenser. The handles is crafted from locally sourced Vermont maple hardwood for beauty, strength and durability. The eagle is laser cut for crisp detail and all images are inkjet printed for optimal detail. The non-toxic ink is covered in glossy lacquer for protection and beauty. The ferrule is chrome plated brass and the zinc plated connector threads are standard 3/8" -16 UNC threads to fit most beer dispensers. To make this tap handle even more valuable as a collectible, the tap handle includes a wood base with felt protectors to use as a display stand. The overall dimensions are 4"L x 4"W x 15"H (including the base). Designed and manufactured in the USA by Maple Landmark.